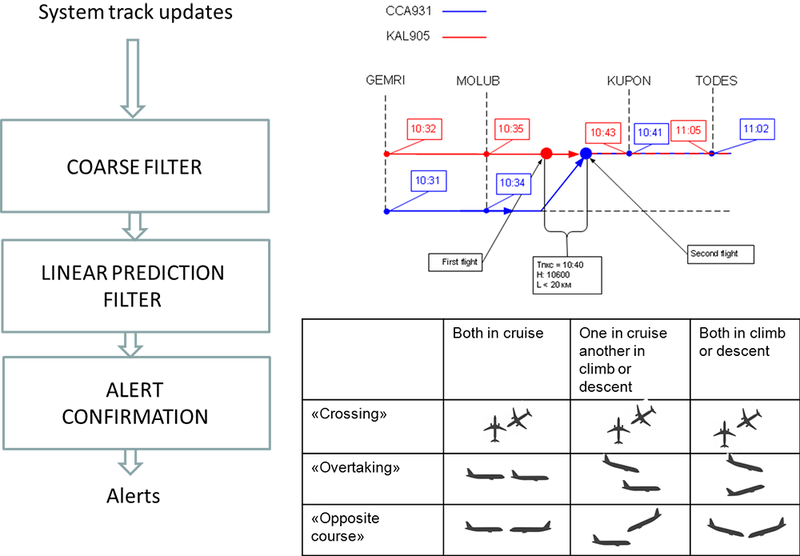 Evaluation of ATM system status, airspace and flight condition changes impact on airspace use efficiency. 3D visual presentation of selected RCs and RC sectors. Optimal 4D route generation within various constraints. 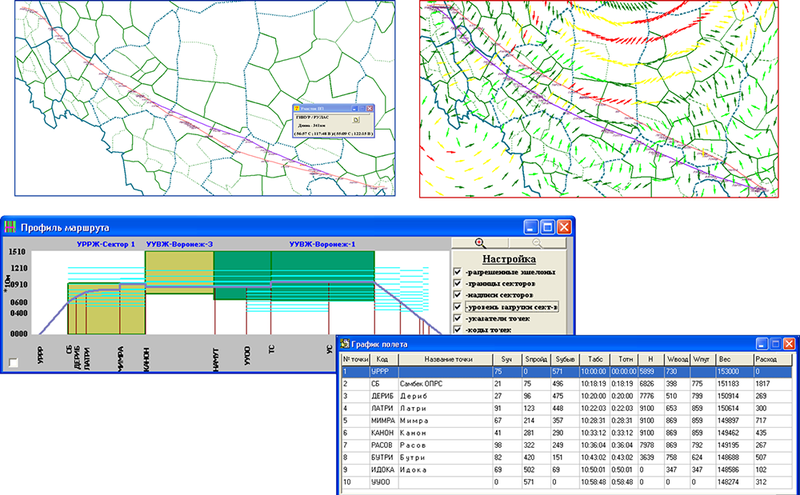 Simulation-based RC sector capacity assessment using real flight data. Data import/export (interoperability with other AS and simulation facilities). cost criterion (including fuel consumption). Rerouting in case of temporary airspace use restrictions for a variety of special events. 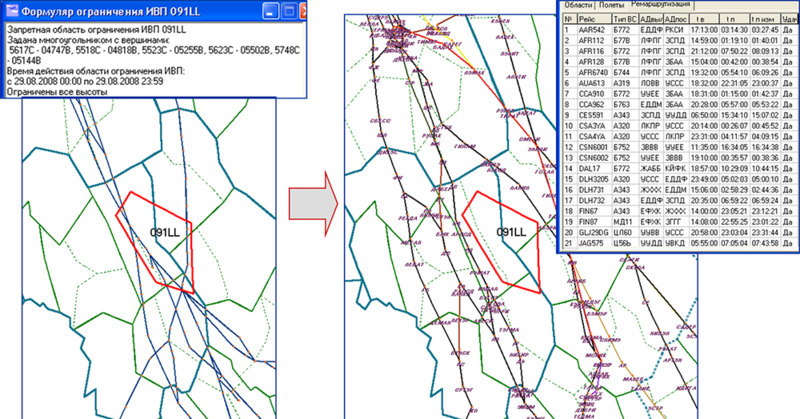 Track diversion assessment due to RF airspace structure modernization. Evaluation of airline rerouting proposals. Evaluation of the change of the number of potentially conflict situations in case of the upper airspace structure modernization. Analysis of the efficiency of proposed airspace restructuring (airspace element traffic, evaluation of ATC RC and AC sector controller capacity). ATC RC sector capacity calculation. Formulation of proposals on optimum RC airspace use in response to permissible sector capacity overrun in specified RC airspace use options. Proposals on sector reconfiguration (dynamic sectorization) for ATM system efficiency improvement and more uniform air traffic controller loading. Weather effects on flight operations in the upper airspace and in the airport area. expansion in the number of potentially conflict situations under the current airspace structure and during airspace structure modernization. RC resectorization (and sector scheduling) decision making. Identification of possible separation rules violation during aircraft flight simulation at the following stages: during track diversion, on approach and departure routes in the airport area. Research in support of assessment of separation rules change and new procedures (RNAV, RNP) introduction effects on flight safety (the number of possible separation rules violations). 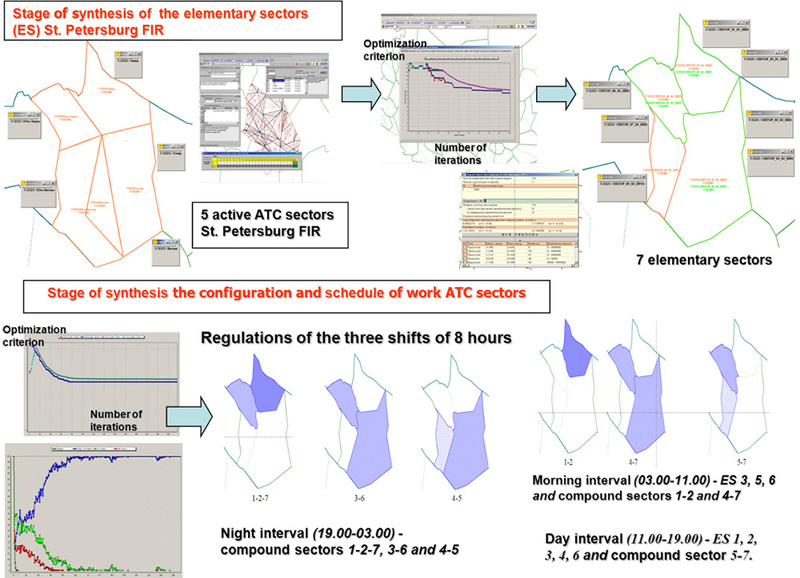 Simulation-based assessment of operating characteristics of projected airspace structure of Moscow ATMIS and Moscow terminal control region to verify the achievement of specified strategic goals and target values of flight safety, capacity and efficiency of services rendered to airspace users, 2015.